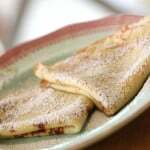 An easy crepe recipe that is foolproof if you follow this recipe exactly. So great for a breakfast treat or make ahead and serve them as a dessert! In a large bowl whisk together the flour, sugar and salt. Then pour in the milk, and whisk until very smooth. Then add the beaten eggs, and then add the melted butter. Dab some grapeseed oil on a paper towel and liberally grease a non-stick skillet that measures 9 ½ inches at the bottom (total circumference of pan will be around 12 inches). Heat pan on medium high heat, until hot. Ladle out 1 serving of batter with a standard sized soup ladle. Swirl batter around the pan, until it completely covers the bottom, but does not ride up on the sides. Your crepe will be easier to flip and remain more uniform in shape if you prevent the batter from riding up. Once the batter looks dry on the top and the edges begin to turn golden brown, take a long , skinny metal spatula and slide it under all the sides, loosening it from the edge. Then raise up one side, gently grab it with your hands and flip! These are also great for dessert with my homemade chocolate sauce! To make the chocolate sauce melt chocolate chips and heavy cream in a sauce pan. Once melted add honey and vanilla. Stir to combine and serve warm over ice cream. Store in fridge, and microwave to re-liquify. Will last for a week in the fridge.